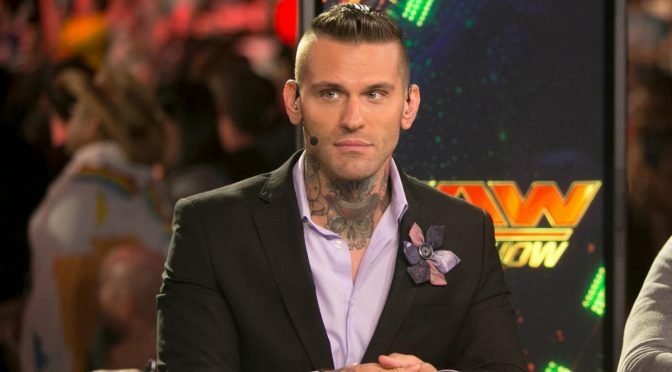 At one point in his career, fans saw Corey Graves as a true punk, in the best ways possible. He spoke his mind, he stood up for what was right – or so they believed and he was counter culture. 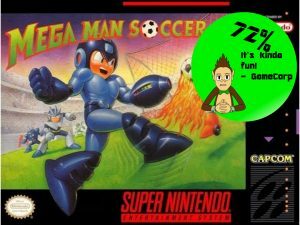 In recent years however, he’s become just another corporate shill. 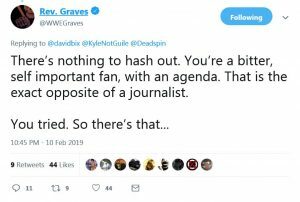 Last night however, Graves reached peak stupid. Bill DeMott was accused of many things during his time as WWE’s Developmental Head Coach and not by “bitter” wrestlers either, we’re talking the top guys in the business who went through developmental during his tenure. 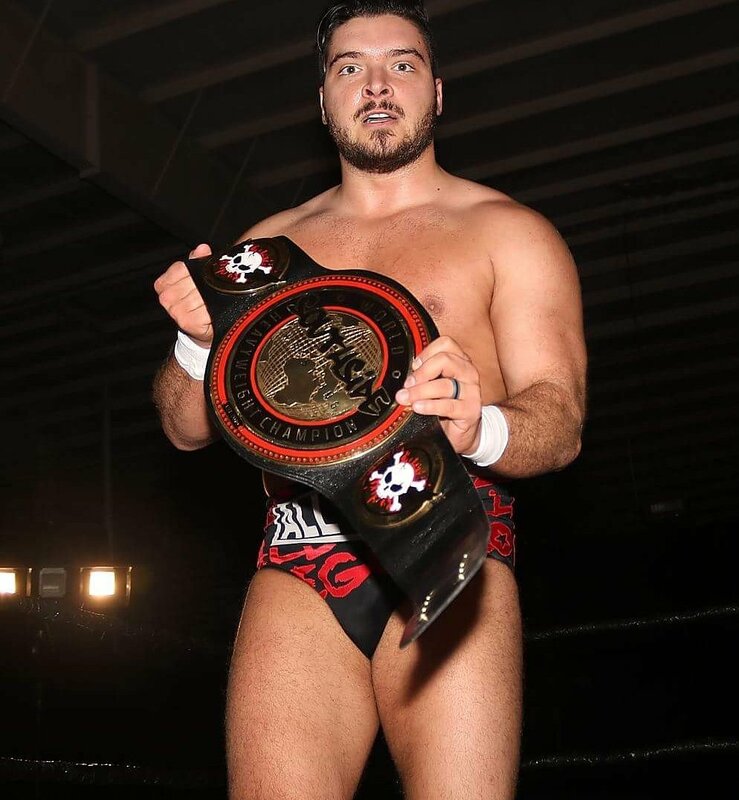 He was accused of striking Ethan Carter III (EC3) in the head while he had a concussion, allowing one wrestler to stink-face another with a cupcake in the latter’s mouth, using racial and derogatory language, as well as injuring students by over working them. 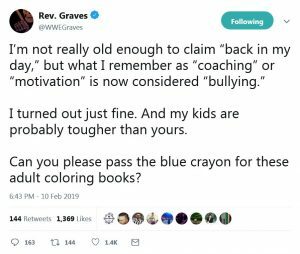 Graves doesn’t think this makes DeMott a bad guy, in fact he thinks this makes DeMott a great teacher and coach. 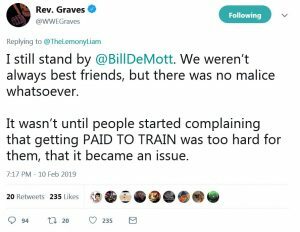 Keep in mind that Graves had to retire due to concussions, and I have to wonder how many concussions DeMott gave Graves, or made him work through. I have a real concern that either Graves is abusing drugs or is showing signs of possible CTE development. I say this with no malice or desire to see him in pain. I genuinely worry that he is in the middle of an episode of sorts. Unfortunately the comments continued, insulting welfare recipients and almost bragging about surviving an overdose attempt. The rant seemed to start over his hatred of David Bixenspan for some reason, though Bixenspan is quite respected by many fellow journalists, so that seems to be off. 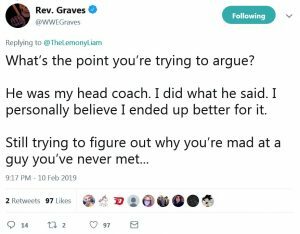 Bixenspan even reached out to Graves to try and figure out the issue, but Graves was too cool for school, insulted him again and blew him off (Tweet image to the right). Quick Hits – Fox Sports Australia is reporting Australian talents Jonah Rock and Elliot Sexton have signed with the WWE. Reports of Nia Jax and Dean Ambrose wrestling at a house show are being reported by POST Wrestling as being outdated, and possibly were the direction they were hoping to go before Ambrose put in his notice. Congratulations go out to Apollo Crews and his wife Linda for welcoming their second baby, their first boy, over the weekend. Previous PostMaximum Carnage – GameCorp PodcastNext PostMajor ‘Flash’ Star Rumored to Be Leaving Show and More Nerd News!